Easy run on the Provo River Trail with Ted in the morning. Averaged 7:27 pace, Garmin 305 reported the average heart rate of 119 in spite of going crazy at some point and hitting a max of 151. I never ran fast enough to get that heart rate, so I assume it was off for a small segment of the run. Felt sleepy. Getting over the cold. Apparently it is only at the respiratory level, otherwise the heart rate would have been higher. Ran with the kids in the afternoon. Figured out a new way to motivate Benjamin - let Jenny out of the stroller at the end of his fast 0.5 segment with 0.1 to go. Today this resulted in a fit which kept him from catching her, but he ran the last quarter in 1:47 nevertheless. Afterwards we had a talk and he did some attitude improvement core strength exercises. He needs to do them anyway, and he gets in trouble enough during the day to get his fair share. I also made him write about the experience in his blog, which he did, although rather reluctantly. Went to see Dr. Jex. He took lots of X-rays. The good news is that my neck curve has made the most significant improvement since we started the treatment. The curvature angle is now 27 degrees with the forward head tilt of 5 mm. An improvement from 16 degrees/18 mm in the beginning, and 20 degrees/9 mm about a month ago. The ideal measurement is 35-45 degrees and 0 mm tilt. So we are on the right track in the way of neck correction. The shoulder weights we added have helped a lot. The lumbar curve is almost normal while standing up, but I lose entirely (down to 0) when I sit down. The lower spine has a lateral curve towards the right. In theory, hip weights should correct it. However, with the hip weights on it becomes worse (always bending towards the right) regardless of the direction of the torque the hip weights are positioned to create. Dr. Jex was rather perplexed by this. Indeed my lower back is both literally and figuratively is throwing him a curve. He decided to take a more thorough look at it. We are going to have even a longer research session on Thursday. I am excited about this. Finally we are getting somewhere. For a while I felt like we were trotting in place. I have always felt that a thorough research is what this problem needed. But I could never find a specialist that would recognize the need and be willing to do what it takes. I think I have a clue as to where the whole problem came from. Between the ages of 12 and 13 I ran 4 hard track workouts a week at the Znamenskiye indoor track in Moscow (Maria would know that one very well). They were all high volume and high intensity. Here is an example of a three day segment from one week that I recall: Monday, 6000 m in 21:42 (5:45/mile pace). Tuesday, 1000 in 3:09, 800 in 2:30, 600 in 1:48. Wednesday - 600 m in 1:47, 400 m in 67, and 200 in 32. My coach loved to give us tempo runs on the indoor track which I would do usually at a pace faster that 6:00 per mile. I can only imagine what that could have done to the developing bones and muscles - you hit a sharply sloped curve that is about 25-30 meters long that gives you a 180 degree turnaround 16 times a mile and at a high speed times and again. So, yes, Dr. Jex is dealing with a very unusual case. Very few people get this sort of damage. And the few that do rarely even think about it, much less care to get it fixed, just happy to run where they are at if they continue to run at all. Not me. I am persistent. I will not let this be in my way. I will not give up hope, I will not quit. I'll find a way to get it fixed and run at my true potential. Easy run with Ted in the morning. Very slow and relaxed. Ran with the kids in the afternoon. In the evening started feeling chills and very fatigued. Sinus infection, this time a bit stronger than normal. Went to bed early. Taking it easy for the next couple of days. Slept in this morning to allow myself to get over the cold. Took the whole day easy. Did not run until late afternoon. First ran with the kids. We had an adventure with Benjamin being chased by a dog. It was a small dog, but he got really scared and swerved in panic. But he still managed a good last 0.5 in 3:38 with the quarter splits of 1:49 and 1:49. The dog quarter would probably have been 1:46 or maybe even faster if he had not panicked. Afterwards, I went for a 5 mile run and Benjamin rode his bike with me. We started out at 7:30 pace, then gradually warmed into 6:35-6:40. The construction around Geneva road slowed us down. My heart rate was hovering around 140 at 6:35 pace, which is about 6 beats per minute higher than normal. That is to be expected with the sinus infection. On the last 0.4 Benjamin decided to test my limits. Sick or not, I still have some competitive spirit, so I responded to the challenge. Then with 0.1 to go I decided to show him class and picked up the pace. He held up fine for as long as we were going 5:20 pace, but his little bike could not go any faster. The turn with 60 meters to go did not help either. The last quarter was 1:19. At first, I thought it was only 1:29 and figured I must be really sick if I had to work that hard to run that slow. The good news is that it felt easy enough for me to consider it could have been 1:29. Worked some on the GMap for the Course Tool. I got it to the point where you can go to a location of your choice, zoom in and out, toggle between satellite, hybrid, and regular map, and plot course. I still need to figure out a way to save the course data, and obtain the elevations. Hopefully will have it ready in a few days. Felt better this morning, although still not 100% over the sinus infection. Ran with Ted early in the morning. 8.3 miles, easy pace. Ted told me about Weldon Johnson's training method that he credits for the improvement from 29:30 to 28:17 10 K. First, all speed work and tempo runs must be done by feel - do not look at the watch until you are done with the workout. Second, easy runs must be as easy as the body wants them. For Weldon, this often went going 7:30 per mile. He often ran 140 miles per week with the page averaging 7:00 mile including his speed work. First day of Benjamin's Team Provo practice. Ran some with him. He ran some extra afterwards. Feeling better, but still not 100%. Ran easy with Ted, 8.6 miles. Pretty much the entire run we debated the issue of the correlation between 100 meter sprint and marathon potential in the same runner. His point of view - there are way too many factors that could either make a good marathoner sprint slow, or a fast sprinter run a poor marathon for the correlation to exist. My point of view - while a fast sprint does not guarantee a fast marathon, and a slow sprinter has some hope in the marathon, a slow sprint puts a cap on your marathon performance. Being able to sprint not too terribly slow is a necessary but not sufficient condition for a good marathon performance. We agree with each other to a point, the disagreement is in the numbers. My contention that Ted disagrees with - unless you have an extreme proportion of slow-twitch fibers ( Alberto Salazar style) which is found probably in no more than 3% of all distance runners, 100 meter time of 15.0 means you will not run much faster than 2:30 in the marathon. This actually makes a nice rule - take your 100 meter time in seconds, do it times ten. That is your limit in the marathon in minutes. We also had a disagreement on how fast a slower runner (that runs a marathon in over 3:00 even with some decent training) could run 100 meters. So I thought it would be helpful to gather some data for our future discussions, and perhaps also for inspiring some more serious exercise physiology research. If you would like to contribute, please submit the following data in the comments - does not have to be current, but needs to come from the same time period: your marathon performance, the training you did to achieve it, your 100 meter performance from the same time period, and the specific 100 meter training you did to achieve it (for most of us it will be nothing more than some strides and short speed work intervals at best). Ran with the kids in the afternoon. Feeling a bit better towards the evening, good sign, sinus infection pain is going away. Felt better than the day before, but still not 100%. Still yellow stuff coming out of my nose, some sinus pain, cough, and a bit of overall weakness. Ted wanted to do 15 miles. I was not quite up to the distance. However, I figured a few miles at marathon pace would be helpful as a health test. We went up the Provo Canyon. Almost hit a gate over by Bridal Veil Falls, good thing it was white and Ted has good eyes, we stopped soon enough. Then we hit a few patches of ice. Then we turned around and ran back to the start of the standard 3 mile tempo at Nunn's park. 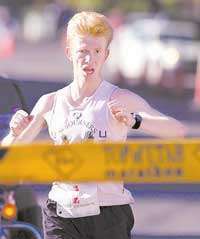 For a change, I decided to try Weldon Johnson's idea of not looking at the watch during the run. We ran 3 miles down, immediate 180 turn, and then 1 mile back up. My splits were 5:42 (HR 142), 5:42 (HR 151), 5:29 (HR 154) and 6:20 (HR 155). The effort felt harder than the HR feedback, but the breathing was appropriate for the level of HR. I think the respiratory congestion created a false perception of difficulty. I think I really like the idea of looking at the watch afterwards. Total of 11 miles of for the run.